Download "when it comes. Benjamin Disraeli to be ready for opportunity The secret of success is What is CRM? Why CRM? About Agiline CRM"
2 CONTACT AND ACCOUNT MANAGEMENT Customizable Dashboards Workgroup Calendaring & Scheduling To-Do s List Integrated and Fax Resource Scheduling Expense Tracking & Reporting Attach Documents Integration with Microsoft Office Synchronization with Palm and Pocket PC Devices Activity Timer Automated Business Triggers Project Management Knowledge Base Global Search Graphical Workflows Speed & Accuracy Agiline CRM captures all customer communications in detail, whether through phone , fax, Internet or personal contact. Empowering your representatives with relevant customer data enables them to provide a high level of customer service. 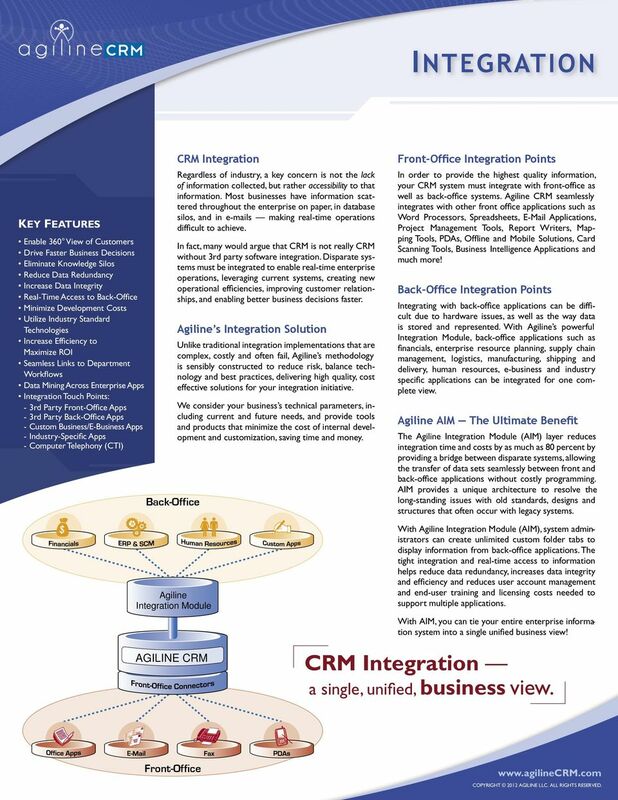 Comprehensive Customer Information Users can easily review past communications and upcoming activities, sales opportunities, quotes and purchases, support issues, links to relevant documents and information from back-end systems with Agiline CRM s comprehensive Main Contact Screen. Customizable Dashboards Empower users with instant access to real-time graphical analytics including activity lists, sale forecasting and statistics, marketing graphs and service gauges. Managers can see a snapshot of corporate metrics, spot potential problems, drill-down to individual records and push critical data to employees. Business Process Manager Agiline CRM provides advanced Business Intelligence features that can be used to streamline labor-intensive processes, such as automated customer responses and follow-ups. Criteria can be easily modified in response to changing business requirements. Scheduling & Task Management Agiline CRM includes fully-integrated workgroup scheduling and task management features to track activities, participants and resources, including pop-up reminders. Managing to-do lists is easy with sorting and filter options to help ensure that important activities are completed on time. Integrated Project Management Built-in project management features help users efficiently organize and track tasks and resources to keep projects on time and within budget. Synchronize with Microsoft Project for advanced analysis and report generation. Knowledge Base Agiline CRM s centralized knowledge base allows employees to leverage knowledge of company policies, product information and Frequently Asked Questions, to standardize handling, improve response time and shorten ramp-up time. Workflows Managers can easily design graphical workflows to help ensure that processes are carried out consistently and efficiently. Representatives can then access these workflows to guide them through the process of handling customer inquiries and internal procedures. Gain Insight With Agiline CRM s advanced analysis features, both managers and employees can access a range of tools to review and improve productivity. Modify over 200 included reports to fit your business needs, or utilize Crystal Reports for ad-hoc requirements. Deliver fast and accurate information across your entire enterprise. 3 SALES AUTOMATION Opportunity Management Forecasting & Pipeline Analysis Sales Workflow Automation Lead Generation & Routing Team Selling & Management Dashboard Analytics Inventory & Quotes Competitor Intelligence Source Tracking Lookups & Groups Integrated and Fax Automated Business Triggers Productivity Analysis Sales Stage Tracking Partner Opportunity Management Knowledge Base Win/Loss Analysis Literature Fulfillment Cross-sell and Up-sell Analysis Integrated Marketing and Customer Service Web Resources for Research Back-Office Integration Increase Profitability To achieve peak performance, sales teams need easyto-master tools which provide accurate and effective results that translate into increased revenues and profitability. 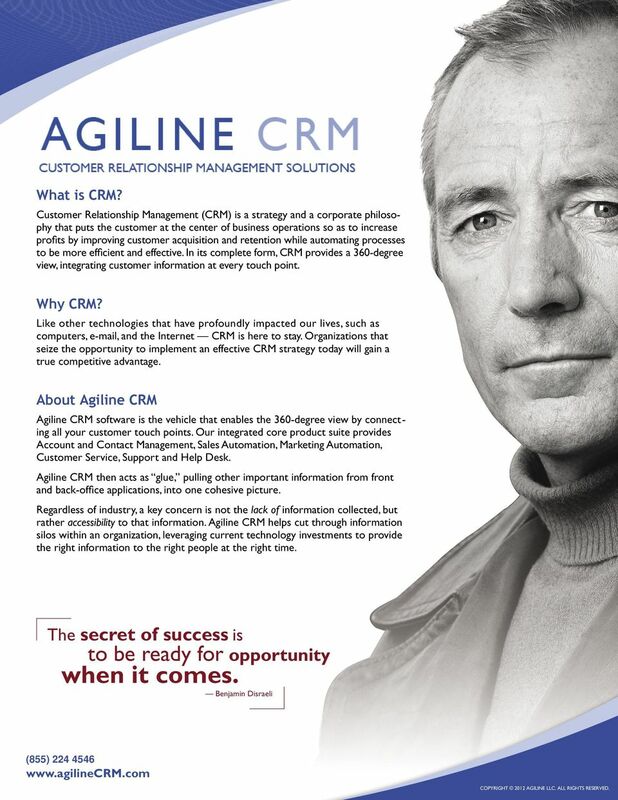 Agiline CRM includes the features salespeople need to provide a consistent approach that drives sales. 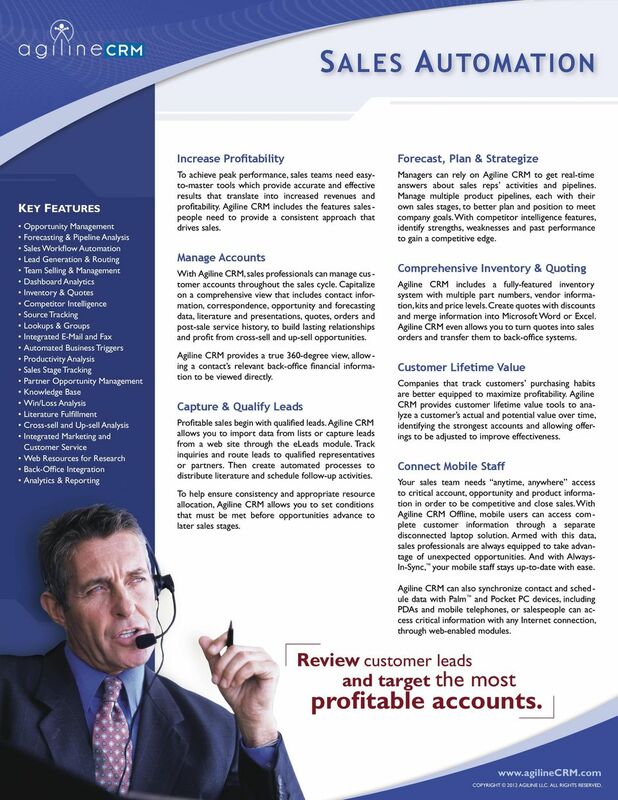 Manage Accounts With Agiline CRM, sales professionals can manage customer accounts throughout the sales cycle. Capitalize on a comprehensive view that includes contact information, correspondence, opportunity and forecasting data, literature and presentations, quotes, orders and post-sale service history, to build lasting relationships and profit from cross-sell and up-sell opportunities. Agiline CRM provides a true 360-degree view, allowing a contact s relevant back-office financial information to be viewed directly. Capture & Qualify Leads Profitable sales begin with qualified leads. Agiline CRM allows you to import data from lists or capture leads from a web site through the eleads module. Track inquiries and route leads to qualified representatives or partners. Then create automated processes to distribute literature and schedule follow-up activities. To help ensure consistency and appropriate resource allocation, Agiline CRM allows you to set conditions that must be met before opportunities advance to later sales stages. Forecast, Plan & Strategize Managers can rely on Agiline CRM to get real-time answers about sales reps activities and pipelines. Manage multiple product pipelines, each with their own sales stages, to better plan and position to meet company goals. With competitor intelligence features, identify strengths, weaknesses and past performance to gain a competitive edge. Comprehensive Inventory & Quoting Agiline CRM includes a fully-featured inventory system with multiple part numbers, vendor information, kits and price levels. Create quotes with discounts and merge information into Microsoft Word or Excel. Agiline CRM even allows you to turn quotes into sales orders and transfer them to back-office systems. Customer Lifetime Value Companies that track customers purchasing habits are better equipped to maximize profitability. Agiline CRM provides customer lifetime value tools to analyze a customer s actual and potential value over time, identifying the strongest accounts and allowing offerings to be adjusted to improve effectiveness. Connect Mobile Staff Your sales team needs anytime, anywhere access to critical account, opportunity and product information in order to be competitive and close sales. With Agiline CRM Offline, mobile users can access complete customer information through a separate disconnected laptop solution. Armed with this data, sales professionals are always equipped to take advantage of unexpected opportunities. And with Always- In-Sync, your mobile staff stays up-to-date with ease. Agiline CRM can also synchronize contact and schedule data with Palm and Pocket PC devices, including PDAs and mobile telephones, or salespeople can access critical information with any Internet connection, through web-enabled modules. Review customer leads and target the most profitable accounts. 4 MARKETING AUTOMATION Campaign Management ROI Analysis Customizable Dashboards Marketing Workflow Automation Data Mining Opt-In and Opt-Out Campaigns Capture Leads from the Internet Traditional Leads Importing Customer Surveys Integrated and Fax Contact Group Management Letter Management Integrated Sales and Customer Service Cross-Sell / Up-Sell Analysis Web Resources for Research Tools that Deliver Results The world of marketing is ever-changing. In addition to tracking the results of advertisements, direct mail and telemarketing, organizations must build lasting and profitable customer relationships by executing effective and timely campaigns over both traditional and electronic channels. 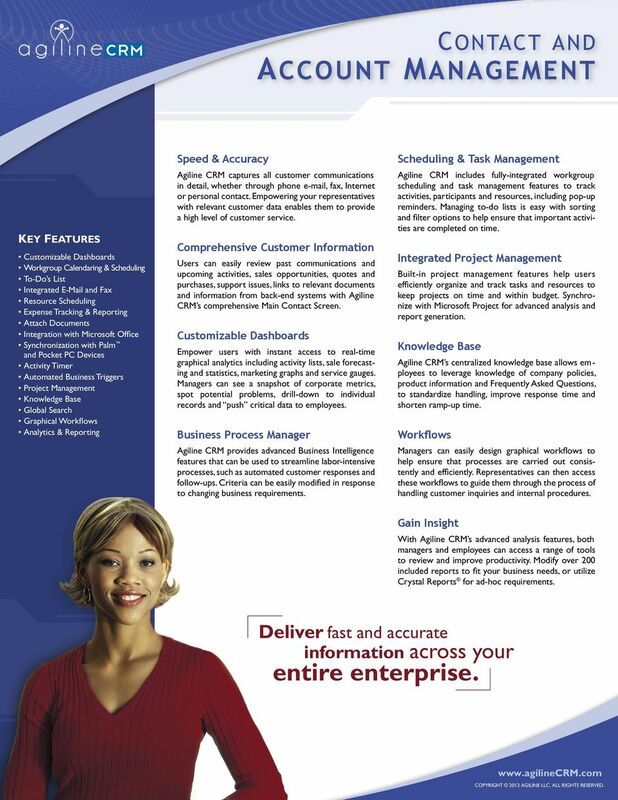 Agiline CRM delivers a comprehensive means to design, execute, and manage personalized, permission-based campaigns. Manage Campaigns Effectively Agiline CRM allows you to plan multi-channel marketing campaigns and execute them flawlessly. Assign tasks and responsibilities according to revenue projections, campaign periods, targeted audiences and channels. Identify potential deployment issues and re-allocate resources. Utilize contact grouping to optimize segmentation strategies, by mining comprehensive customer data. Create targeted and fax campaigns for automated execution and follow-up. Use integrated data mining to find the optimal approach for targeting prospects, so your customers receive the right offers at the right time. With the eleads module, you can capture leads from your web site and then automatically distribute them across sales teams or channel partners for follow-up. Customer Surveys Agiline CRM enables you to conduct customer surveys in a cost-effective, targeted manner. Your customers and prospects will be more receptive to providing you with valuable feedback as you allow them to respond at their convenience, via and/or through Web Self-Service. And by using Agiline CRM, you will be able to track, tally and analyze survey results with ease. 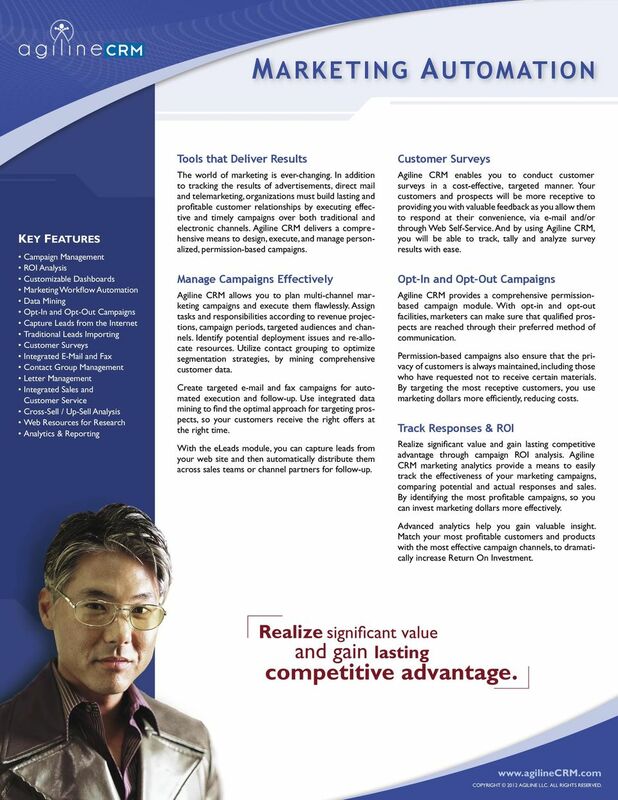 Opt-In and Opt-Out Campaigns Agiline CRM provides a comprehensive permissionbased campaign module. With opt-in and opt-out facilities, marketers can make sure that qualified prospects are reached through their preferred method of communication. Permission-based campaigns also ensure that the privacy of customers is always maintained, including those who have requested not to receive certain materials. By targeting the most receptive customers, you use marketing dollars more efficiently, reducing costs. Track Responses & ROI Realize significant value and gain lasting competitive advantage through campaign ROI analysis. Agiline CRM marketing analytics provide a means to easily track the effectiveness of your marketing campaigns, comparing potential and actual responses and sales. By identifying the most profitable campaigns, so you can invest marketing dollars more effectively. Advanced analytics help you gain valuable insight. Match your most profitable customers and products with the most effective campaign channels, to dramatically increase Return On Investment. Realize significant value and gain lasting competitive advantage. 5 CUSTOMER SERVICE AND SUPPORT Open, Track & Resolve Support Incidents Unlimited Support Tickets Per Contact Quick View of Support Cycle Track Resolution Time & Costs Service Level Agreements (SLAs) Track Billing Information Complete Customer History Automatically Convert into Tickets Return Merchandise Authorizations (RMAs) Knowledge Base Support Process Automation Track Activities Attach Documents Web-based Customer Self-Service Track Support Productivity Graphical Support Flashboard Empower Your Support Staff By managing, synchronizing, and coordinating customer interactions across all channels, including telephone, , fax and Internet, your company has the information required to deliver world-class service and generate additional sales. Agiline CRM provides an integrated system that not only allows representatives to track service communications, but empowers your entire team with the comprehensive overview needed to improve customer satisfaction, reduce churn and maximize revenue and profitability. Reduce Time and Costs The key to providing outstanding customer support is resolving customer inquiries quickly and accurately. Agiline CRM enables your support personnel to work efficiently by providing a complete help desk system that tracks inquiries and issues, as well as an integrated support knowledge base with keyword searches. Complete tracking of customer history, likes and dislikes as well as case lifecycle provide a full picture of each customer, resulting in your ability to provide better support in less time. Track contracts and Service Level Agreements (SLAs) and create Return Merchandise Authorizations (RMAs) directly in Agiline CRM. The Agiline Web Self-Service module provides clients with Internet knowledge base search as well as ticket submission and review for self-service support resolutions. Anytime access improves customer satisfaction while reducing support costs. Business Process Automation Agiline CRM provides advanced Business Intelligence features with a Support Process Manager to handle routing, load balancing, escalation, automated response, and even ticket updates and deletions automatically. By automating labor-intensive processes, such as routing and responding to support tickets and notifying customers of soon-to-expire SLAs, support representatives can focus on providing faster responses and more personalized service, improving customer experiences and profitability. 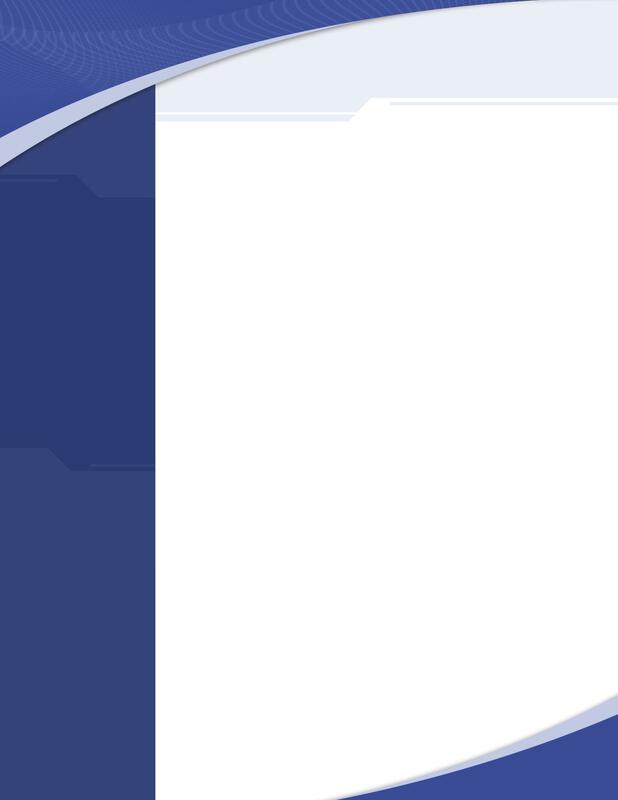 Automatically convert incoming messages into support tickets, including attachments. Agiline CRM support rules can then search the tickets for keywords and automatically respond and/or load balance them amongst qualified representatives. Management Tools Agiline CRM provides managers with the tools necessary to review and analyze every aspect of the service cycle. Managers can access reports analyzing appropriate use of staff and resources, including the costs associated with each support incident. To ensure timely resolution of all open issues, managers can customize automated alerts, redirecting and escalating follow-up with the appropriate support personnel. Managers can also update the support knowledge base as a result of past calls and resolutions. The Agiline CRM Support Flashboard is a fully customizable module that provides real-time graphical views of support ticket information. The Flashboard provides valuable workload information and can alert decision makers about potential problems and operability trends within an organization. 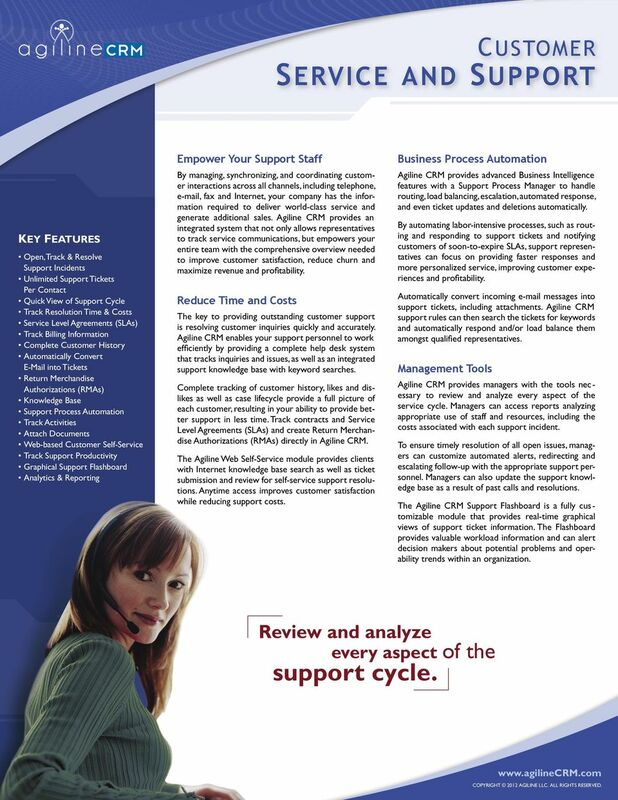 Review and analyze every aspect of the support cycle. 7 ANALYTICS AND REPORTING Customizable Dashboards Over 200 Prebuilt Reports Custom Fields & Views Management Analytics Statistical Analysis Configurable Graphs Ad-Hoc Reporting Automated Reporting Module: - Schedule Weekly, Monthly or Quarterly Performance Reports - Route Scheduled Reports to Designated Users - Print and Route other Windows Documents Measure Performance Empower your employees with tools that enable them to analyze their own performance on a real-time basis, resulting in improved customer service across all touch points. The power to measure performance, not just for a selected few but for all employees, allows them to be more responsive. Agiline CRM provides powerful next-generation business analytics and reporting tools necessary to provide a comprehensive view of your customers. The benefits are faster generation and distribution of reports, more informed decision-making, rapid deployment of changes, increased efficiency and ROI resulting in a reduction in total cost of ownership. CRM Dashboards When customers call, your employees needs an intuitive system that gives them instant access to the information they need. Agiline CRM Dashboards provide graphical analytics including activity lists, sale forecasting and statistics, marketing graphs and service gauges. Instead of having to run a multitude of reports, dashboards provide each member of your team with a comprehensive single view of their responsibilities on one screen. Managers can see a snapshot of corporate metrics, spot potential problems, drill-down to individual records and push critical data to employees. Comprehensive Prebuilt Reports With over 200 prebuilt reports offering hundreds of querying and sorting combinations, employees from the CEO to the service agents will be able to quickly identify, execute and review performance across the entire enterprise. Managers will be able to run reports for individuals as well as teams in order to gain insight into business operations. Powerful Ad-Hoc Reporting For more advanced users, Agiline CRM comes completely integrated with Crystal Reports, the industry s leading reporting tool. Ad-hoc reporting tools deliver fully customizable and configurable solutions that allow creation of an unlimited number of reports throughout the entire organization. Management Analytics In addition to the hundreds of reporting tools available to management, Agiline CRM provides a powerful set of features designed exclusively for executives to monitor the health of their business. These tools provide executives real-time global access to contact, account, service, sales and marketing information. With the ever-changing business climate, executives will be able to review consolidated analysis of key metrics in order to better manage the direction of an organizational unit as well as the entire enterprise. With Agiline CRM, both executives and management will be less reliant on IT departments to monitor the state of the business. Advanced Security With Agiline CRM s advanced security features, administrators define who has access to analytics and reporting tools. This helps ensure that the appropriate person has access to the right set of reporting tools to get the job done efficiently. 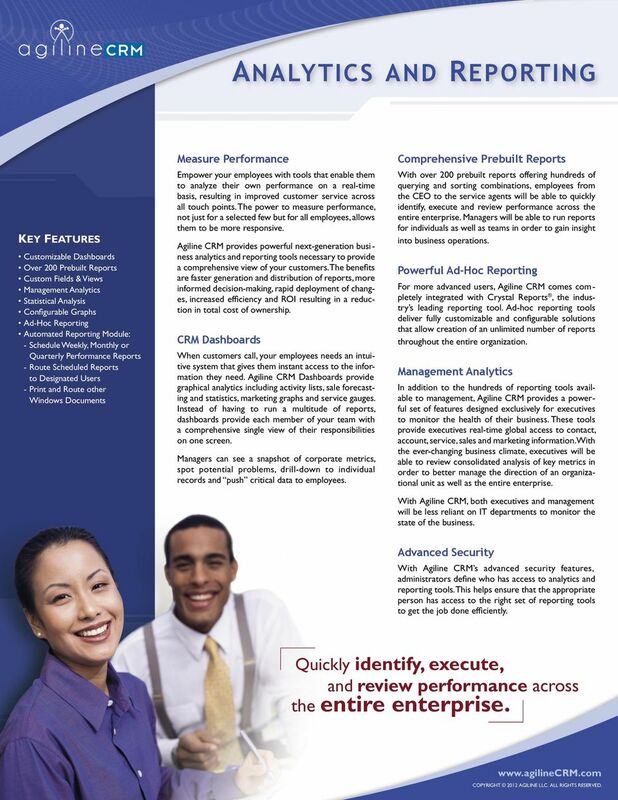 Quickly identify, execute, and review performance across the entire enterprise. SIEBEL CONTACT CENTER AND SERVICE APPLICATIONS Deliver a great customer experience that sets you apart, improves efficiency and drives profitability with Oracle s Siebel Contact Center and Service applications. Terrasoft represents the new generation of cost-effective and results-producing CRM vendors focused exclusively on the mid-enterprise and SME market. NetSuite OpenAir. The World s #1 Cloud Professional Services Automation Solution. Why NetSuite OpenAir? NETSUITE BENEFITS. Products CRM and Business Intelligence for DNA Leverage Your Financial Institution s Rich, Robust Data to Analyze Performance and Build Stronger Accountholder Relationships Products Knowledge is power. CRM EMPOWER EMPLOYEES is a comprehensive, award-winning, wireless and Internet-based solution that provides enterprise-wide access to vital customer, partner and prospect information anytime, anywhere.